Habitat: Comfrey is native to Europe and temperate regions of Asia. Grows well on moist soils, damp places, river banks and ditches. 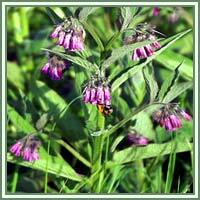 Description: Comfrey is a perennial plant, grows to 1 meter tall. Its root is black on the outside, white and fleshy inside. It has a thick, hairy stem, and large, dark green, ovate to lanceolate leaves. Flowers are bell-shaped and small, varying in color: from white, creamy white to light purple and pink. Flowers are densely arranged in clusters. Bloom period lasts from late spring through summer. Useful components: Allantoin, inulin, mucilage, pyrrolizidine alkaloids, proteins, steroidal saponins, tannins. Medicinal use: Traditionally, Comfrey was used to treat gastrointestinal disorders, wounds and inflammations that followed sprains and broken bones. Useful substance, allantonin, found in root and leaves facilitates the process of skin regeneration. Comfrey was usually used externally to treat bruises, pulled ligaments, fractures, joint pains, sprains, strains and osteoarthritis. Comfrey leaves are used as an addition to baths in treatment of rheumatic complaints, gout, varicose veins, circulation problems, joint pains and swellings. 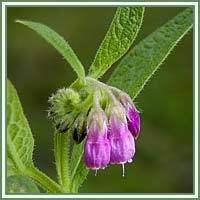 Safety: Comfrey contains pyrrolizidine alkaloids that are highly toxic to the liver and can cause death. Internal use should be avoided. Toxic substances can also be absorbed through the skin, and harmful amounts may build up in the body. It should never be used on broken skin. Please consult your doctor or herbalist before consumption of Comfrey.